Green needlegrass is a cool season grass that is native to the prairies of North America. It can be used both commercially in hay production, and ornamentally in lawns and gardens. Keep reading to learn more about how to grow green needlegrass. What is green needlegrass? Green needlegrass (known as both Stipa viridula and Nassella viridula) is a cool season perennial bunchgrass. Native to the prairies of North America, it ranges as far south as Arizona. Its blades reach a mature height of 1 to 2 feet (30-60 cm.). In early summer, it puts up flower shoots that extend the height of the grass to 16 to 36 inches (40-60 cm.). It is hardy down to USDA zone 4. Green needlegrass grows in the spring and autumn, though its tall, wispy flowers and seed heads appear and mature in the heat of summer, when the plant is technically dormant, so it offers good ornamental interest for all three seasons. Green needlegrass care is relatively simple. It grows best in moist areas with high humidity, and often prefers the edge of lawns and fields, where extra water collects. Once it is established, it is relatively drought tolerant, though it benefits from monthly deep watering. It should be grown in areas that receive at least 17 inches (43 cm.) of annual rainfall. It grows well in full sun to partial shade, and sandy to loamy soil. It can be grown in containers, and also works well as a transition grass planted between flower beds and lawn. 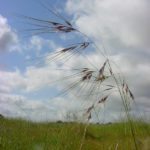 Growing green needlegrass as part of a grass mix for hay and for livestock grazing is also common. It is a nutritious and well liked addition to pasture seed mixes, especially because it recovers very well after grazing.